Yes, you read that correctly, albeit a little confusing. Dorothy Day, a future saint of our modern times, wrote her own version of Thérèse of Lisieux’s “A Story of a Soul” after reading it a second time and having a change of heart on the Little Flower. Day takes the autobiography and adds to her story by interjecting some of her own thoughts and opinions. She inserts additional letters and stories written by the Martin family themselves, to give the reader the exact words and feelings of the family member writing the letter in their own words. Day provides a compelling look into the family life of Thérèse and her sisters while highlighting the harshness of life in the 1800’s. The book begins looking at the early life of St. Thérèse’s parents before they were married and their early married life. I am a mother of 4 healthy girls, so reading about the struggles of Zélie on not being able to nurse (and sending her children to a wet nurse for a year or more!) or loss of sickly children was very heartbreaking. She persevered and even while ill with breast cancer, she did all that she could to care for her family. Louis must have been so heartbroken when he lost the love of his life and had to take care of 5 girls ages 17-4, Thérèse being the youngest. They were a family of modest means and they sent their daughters to boarding school, but life during that period of time was difficult. It is refreshing to read about this holy family and that they struggled spiritually with their children just as we do today. As a parent, it is a great reminder of how difficult it is to raise children to love the Lord “properly” even in pious families as the Martin’s were. All of the living sisters were called to the religious life, although it took Leonie a few times before taking her final vows. The second half of the book covers the short life of Thérèse. Losing her mother at four and a half years old has a profound effect upon a young heart. Thankfully, she had her sisters to help raise her, primarily Pauline. Losing her sisters as each one entered the covenant was like losing her mother over and over again, and while that could have hardened the heart of the Little Flower. She instead turned the pain into sacrifice and offered it up to the Lord, finally learning how to control years of temper tantrums and bouts of crying. She turned what could have been bitterness into love, doing all things no matter how small they were into big love. Covenant living was just as difficult for her, and she experienced a darkness of a soul that caused her to question her vocation but pushed her to further holiness. She became ill, but still persevered in her chores and devotion to Jesus, doing all things with great love. Thank God for Thérèse and Pauline for writing down the life of this little saint. Dorothy Day did not appreciate the Story of a Soul the first time she read it, but after gaining new perspective, the second time through she was inspired to write the biography of Thérèse. She struggled to get it published but preserved and it was originally published in 1960. Day was a Catholic convert who was a social activist and cofounded the Catholic Worker, dedicated to feeding the hungry and sheltering the homeless. In studying the Little Flower, she found they were actually kindred spirits and learned how to love more through the life of Thérèse. I highly recommend this quick read to learn more about St. Thérèse, and to learn more about the thoughts of a future saint, Dorothy Day. You can purchase the book, Thérèse, from Amazon today! Dorothy Day’s unpretentious account of the life of St. Thérèse of Lisieux sheds light on the depth of Day’s Catholic spirituality and illustrates why Thérèse’s simplicity and humility are so vital for today. Whether you are called to the active life like Day or a more hidden existence like Thérèse, you will discover that these paths have much in common and can lead you to a love that has the power to transform you in ways that are unexpected and consequential. 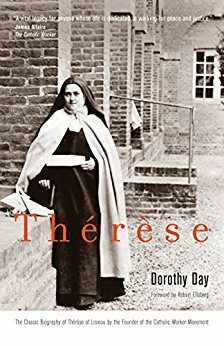 Now back in print, this short biography of St. Thérèse of Lisieux by Dorothy Day expresses the surprising yet profound connection between Day—the founder of the Catholic Worker movement who was praised by Pope Francis for her passion for justice and dedication to her faith—and the beloved saint best known for her Little Way. When Day first read St. Thérèse’s autobiography, The Story of a Soul in 1928, she called it “pious pap.” At the time, Day—a social activist who had been living a bohemian lifestyle—had only recently been baptized a Catholic. Some twenty-five years later, Day’s perspective on Thérèse had so completely changed that she was inspired to write this biography. She did not find it an easy task: “Every time I sit down to write that book on the Little Flower I am blocked. . . . I am faced with the humiliating fact that I can write only about myself, a damning fact.” But she persisted, and despite numerous rejections eventually found a publisher for it in 1960. She wrote in the Preface: “In these days of fear and trembling of what man has wrought on earth in destructiveness and hate, Thérèse is the saint we need.” Written originally for nonbelievers or those unaware of Thérèse, the book reflects how Day came to appreciate Thérèse’s Little Way, not as an abstract concept, but as a spirituality that she had already been living. The Catholic Worker, which she cofounded with Peter Maurin, was dedicated to feeding the hungry and sheltering the homeless. Day’s life, like Thérèse’s, was filled with all the humble, self-effacing jobs that were a part of this work. She found in Thérèse a kindred spirit, one who saw these simple hidden tasks as the way to heaven. “We want to grow in love but do not know how. Love is a science, a knowledge, and we lack it,” Day wrote. Just as Day had a conversion of heart about the Little Way, you, too, can be changed by Thérèse’s simple, yet profound spirituality. Catholic Upgrade, love, Prayer cards, Saints. Bookmark.